FRESNO, CA–On Saturday, April 24th, the Armenian National Committee of Fresno-Central California (ANC Central CA) commemorated the 95th Anniversary of the Armenian Genocide with its annual “Walk for Remembrance” which culminated at Fresno City Hall. There, the over 500 local residents were joined by city officials and community leaders to pay homage to the victims and call for Congressional recognition of this crime against humanity. “Today we are gathered to pay homage to those that gave the ultimate sacrifice and celebrate those that were able to survive — and to those of us that are members of the diaspora, to make certain that we educate the next generation,” remarked Fresno City Council Member Andreas Borgeas who served as the event’s emcee. He was joined by US Representative Jim Costa (CA-20-D) who recalled his efforts to urge Turkey to confront its genocidal past. The community keynote address was delivered by former ANC regional Board Member and Chairperson Raffi Hamparian. He reminded those gathered of the community’s responsibility to the few remaining survivors to continue to the fight for recognition and justice. As part of its weekend commemoration events, the Fresno Armenian community also hosted a lecture by Dr. Taner Akcam at Saint Paul Armenian Church. The Armenian National Committee of Fresno-Central California advances the social, economic, cultural, and political rights of the area’s Armenian American community and promotes increased Armenian American civic participation at the grassroots and public policy levels. Hye,the Ottoman Turks and their leaderships that followed shall have been brought to face justice in the early 20th century – paid reparations and more for the vile slaughters, rapes, tortures the Ottoman mentality devised and pursued 1915-1923 – but the Turkish Genocide of the Armenian nation has not ended for the Turks still seeks to demean Armenia – into 2010. 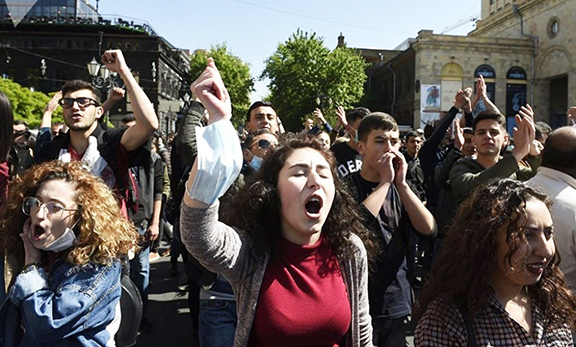 Until the Turks face their guilt, the Armenian Genocide has not ended. The cycle of Genocides must be ended else who will be next? Whomever, wherever, whether perpetrated by a foe or an ‘ally’ – the cycle of Genocides is a degrading insult to all humanity…. Lets not forget the millions of other victims of the sword of the Ottoman: The Assyrians, Greeks, Pontic Greeks, Kurds, Syriac, Cypriots, Balkan, Bulgarians, Lebanese Maronites and more. The Islamic Republic of Turkey is no trusted ally to anyone especially the USA. Today’s Turkey is anti-Israel and anti-American, Turkish people burn both our flags at their many rallys. The modern Turkey is no friend to mankind, in Washington DC on 4/24 Turkish Americans danced in front of the Turkish Embassy in celebration of the Armenian Genocide , the tape is on UTube. Afterwards they were invited into the Embassy offices by Ambassador Tan. What kind of human celebrates the killing of innocent civilians, children, women? Turkey pays America and our politicans for their weak friendship, Congressman Schmidt (R-OH) and McMahon (D-NY) are two of the many Congressman paid to squash the recognition of the Armenian Genocide. Not to mention the many paid Turkish Lobbyists: Hastert, Gephardt, Fein to the tune of $45,000 a month. Until the USA can stand up and be the moral compass for the world and call the nations out who perform Genocide the terrible crime will continue. As to forget history we are doomed to repeat it…Haven’t we after all found this to be true? It is good to see the large crowd at Fresno City Hall who remember friends, relatives, who faced these tragedies. We have not forgotten.